Beacon HR Advisors was starting from scratch. 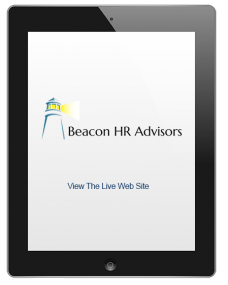 Ed Markowski, Founder, and Principal of Beacon HR Advisors needed a logo, a domain, email, and a Web site. The timeline was quick as this new company was already bidding jobs. It was necessary that they have a visual and virtual presence that would accurately present the company’s talents, and skills to prospective clients. Because the team at Joint Digital has 15+ years of experience in the field, we were up for the challenge. After a few emails, a phone call or two, and some specific questions, Joint Digital delivered on all of the needs for this project. The timeline was such that we kept every aspect of the client’s needs in-house. However, we have also developed many strong relationships through the years with outside vendors–giving our clients all the options they need to deliver their message effectively, efficiently, and in the most appealing way possible. Created a logo that is used on the Web site and all other business communication assets. Leased a new domain, procured a Web hosting solution, designed a site and setup email accounts for employees. Just-in-time training so that the client can perform day-to-day administration of the Web site. Matt did a great job of explaining the pros and cons of various website designs. This provided me necessary information to make educated decisions about the website in a timely manner. I highly recommend Matt and Joint Digital.